The development of the New Zealand mining industry since 1840. Archaeological evidence of early Maori tools, weapons and ornaments demonstrate the variety of stones distributed around New Zealand by 1400 AD, within 150 years of Māori settlement. Former quarries have been identified where blocks of adzite and obsidian were excavated and fragments trimmed to a convenient size. adzite (also called baked argillite) from D’Urville Island and other localities in east Nelson. New Zealand was colonised primarily for agricultural land rather than for its mineral wealth. As an increasing number of European settlers arrived after 1840, they started to search for metals (particularly gold) and coal. Gold rushes in the 1860s led to the migration of men to previously remote areas in Otago, the West Coast, and Coromandel. In 1870 when James Hector, the director of the New Zealand Geological Survey, described the minerals and mining industry in New Zealand, gold, silver, copper, lead and iron had all been discovered, and small-scale mining was under way. Occurrences of chromium, zinc, antimony and other minerals were known. All the main goldfields and coalfields had been discovered, and coal was being mined in many areas around the country. In addition to metallic minerals, kauri gum or resin lying on the ground in Northland was collected, and later buried gum was mined. Most of the gold won in the 1860s was found in rich, surface gravels, and was worked by individuals or small groups using simple equipment. The richer and most accessible ground was quickly exhausted, and larger-scale mining started in the 1870s. Alluvial gold was sluiced and dredged, and hard-rock gold and coal were worked in underground mines. This required substantial capital, and many speculative mining companies were set up, both in New Zealand and overseas. High returns were obtained from the more successful mines. Production of gold varied, but peaked about 1905 and then gradually declined. In contrast, coal production grew steadily to 1 million tonnes in 1900, doubling to 2 million tonnes in 1910, and stayed around that level for the next 70 years. A significant part of the mining revenue before the First World War came from kauri gum, but this declined as the resource became worked out. By 1870 an impressive selection of metal ores had been discovered in New Zealand, but only three metals were successfully mined in 2005 – gold, silver and iron. The total value of mining output (excluding oil and gas) increased steadily after the Second World War, and exceeded $1 billion for the first time in 2004. The increase was due to changes in mining technology and in the products produced, and to increases in export markets. Non-metallic minerals – industrial development within New Zealand since 1950 has led to construction projects needing large amounts of non-metallics, especially aggregate. Iron – large reserves of black ironsands on the west coast of the North Island have been known about for 150 years, but it was not profitable to smelt the sand to produce iron and steel until the 1960s. Now New Zealand Steel produces iron and steel for domestic use and for export. Gold – because the world price of gold was fixed, production gradually declined in the middle of the 20th century. Once the gold price was deregulated in the early 1970s, there was a marked increase in exploration and mining. 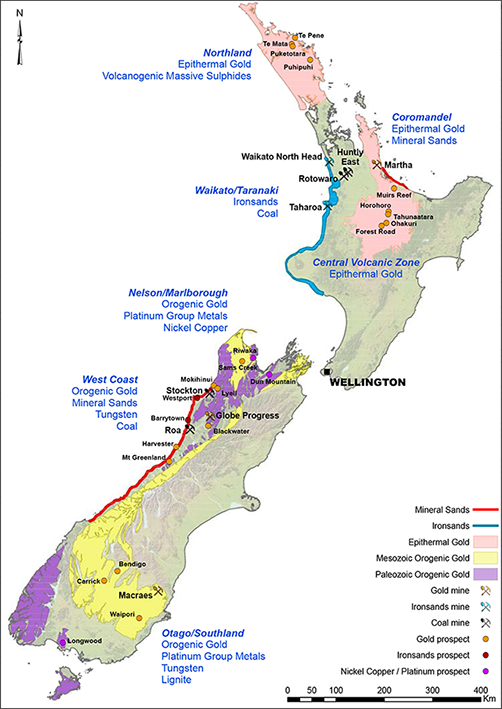 In 2005 most production came from two large opencast mines at Waihī (Coromandel) and Macraes (Otago), with minor production from alluvial mining on the West Coast and in Otago using modern technology. Coal – production fluctuated between 2 and 3 million tonnes for many years. It increased after 1990 with the development of an export market for bituminous coal and passed 5 million tonnes in 2004.